Antisense-mediated exon skipping in Duchenne Muscular Dystrophy aims to restore the expression of dystrophin protein. However, accurate quantification of dystrophin expression is challenging and, therefore, it is difficult to evaluate the outcome of the exon skipping treatment. 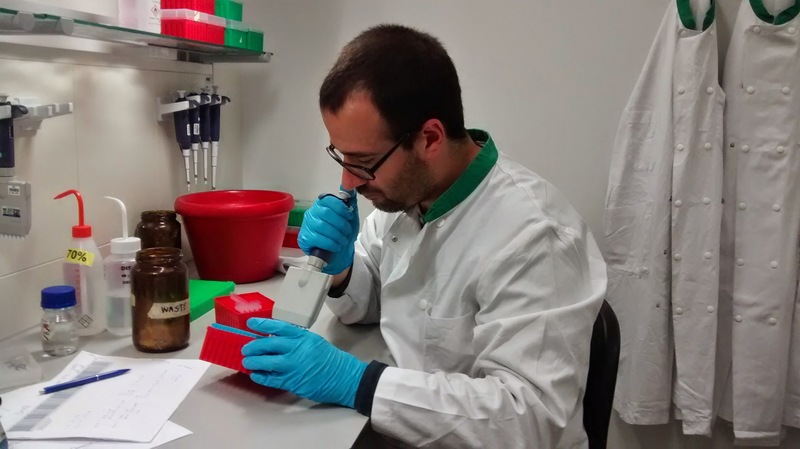 I have just joined COST member Dr Virginia Arechavala-Gomeza’s group in Spain, to collaborate in the project “Quantification of dystrophin restoration by exon skipping”, which aims to develop a reliable RT-qPCR method for dystrophin expression analysis and link dystrophin RNA and protein quantification methods. Although I have extensive experience in the development custom PCR and RT-PCR assays, as well as in gene expression analysis, I haven’t worked in neuromuscular disorders before. Thus, my week-long visit (13-17 April 2015) to the DMD Genetic Therapy Group in the Human Genetics Department at the Leiden University Medical Centre, led by COST member Annemieke Aartsma-Rus, has been extremely beneficial for my future work. During this STSM I was trained in the set-up of different RT-PCR methods to detect and quantify DMD transcript, which have been developed by several of our COST partners. I was also introduced to current data analysis methods to calculate the efficiency of exon skipping. These techniques will be routinely used in the development of our research project, and will be the basis for the development of a new assay for the quantification of dystrophin restoration after exon skipping treatment using antisense oligonucleotides. In addition, I also had the opportunity to visit Prosensa-Biomarin, a biotech company developing antisense oligonucleotides, to learn the basis and data analysis of digital PCR for low abundance transcript quantification. Although this technique is yet too expensive to be routinely used, it can provide a valuable insight on the expected results and pitfalls during the early stages of the project. Finally, I would like to thank Dr. Aartsma-Rus´ team for their warm reception and intensive working plan, among with their constant support during my visit. In conclusion, my short visit has been really fruitful, and the techniques and workflows implemented will be extremely useful for our future work.